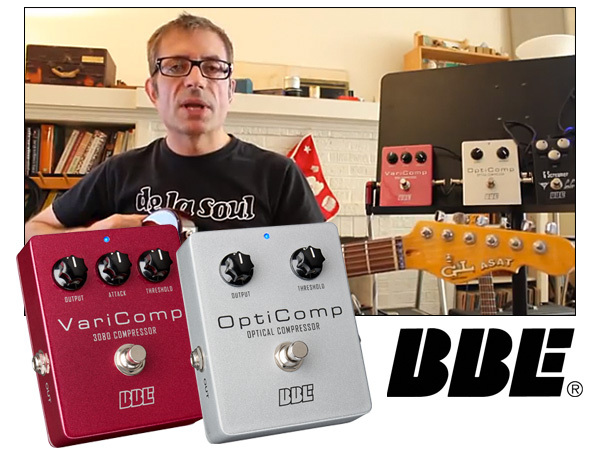 Guitarist Nick Jaffe compares the BBE Opti-Comp™ and VariComp™ compressors in this all-new YouTube instructional video. Nick walks you through the features of each compressor and gives you examples of how each sounds with both guitar (using a cool G&L Tribute Series ASAT Special) and bass. Give the video a watch and then you decide which compressor is right for you. About the BBE OptiComp™: Whether you're just looking to dial in a smoother sound or keep the front end of your amp from clipping, an optical compressor is just the thing. There's none finer than what you'll find in the studio-grade, solid-state OptiComp compressor. For more information, click here. About the BBE VariComp™: VariComp compressor is inspired by some of the coolest vintage compressor pedals around: the old Ross compressor and the early MXR Dynacomp. Think of that sweet, spongy compression in "Sultans of Swing" and "Sweet Home Alabama" and you'll get the idea. VariComp holds true to those iconic originals by using an authentic new old stock (NOS) CA3080 Operational Transconductance Amplifier (OTA) analog device. But as you'd expect from BBE, VariComp is not about just copying an old design - it's about taking the best elements of old favorites and improving the breed. For more information, click here.